India smoothly switched orbit with the Polar Satellite Launch Vehicle (PSLV), launching lunar satellite Chandrayaan-1 on Wednesday. Limited so far to explorations of Earth’s orbit, we move into outer space for the first time. Doubts, if any, about its success were misplaced. PSLV’s 14th flight took off with clockwork precision. What will be under global scrutiny, though, is how the 11 instruments on board work; and how streaming and other data is analysed. Chandrayaan has some of the most sophisticated instruments ever used in lunar exploration. It is expected to provide data crucial for the landing of future manned and unmanned lunar missions. And while Japan and China launched their probes last year, this is no Asian race. Unlike in the past, when the erstwhile Soviet Union and the US raced each other in a show of technical prowess, the renewed interest in lunar explorations is driven, besides scientific curiosity, by mankind’s growing needs. The Japanese and the Americans, who are sending their lunar orbiter in April 2009, are seeking to integrate their data with Chandrayaan’s to arrive at the big picture. That is, how do we make the moon the entry point to Mars and beyond? Colonizing the moon and Mars is no more the prerogative of science fiction. British physicist Stephen Hawking wants renewed investment in missions to these two outposts of the solar system and his key rationale is colonization. The argument that India can’t afford to spend crores on space missions misses the wood for the trees. Years ago, laying the foundation of our space programme, its architect Vikram Sarabhai said, “To us, there is no ambiguity of purpose. 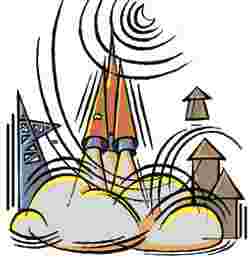 "?With?Chandrayaan-2 announced already, Isro has maintained this clarity of purpose. Although it has spawned a whole set of space components and service industries around its programmes, it should now use this historic moment to sell its brand to attract young people to space science. “Join Isro, see the moon" could be a slogan to convince at least some to look beyond fat pay packets.